Texture is an important element in Leslie Clark’s work that uses fabrics, rice and banana papers, watercolors, acrylics and oil paints to create soulful compositions depicting the nomadic peoples of Africa. Travel and art are interrelated for Clark, who has spent a considerable amount of time living among the Tuareg and Wodaabe tribes of the hot, arid Sahara region. Leslie holds a master of fine arts degree from George Washington University, but feels that her real education in living has come from learning the ways of people who, in their isolation from our technological world, have been able to retain purity and a real dignity of spirit. Clark skillfully expresses these qualities in her paintings. The subjects of her portraits seem to possess an inner light that probes right into the viewer beyond spoken language and cultural differences. 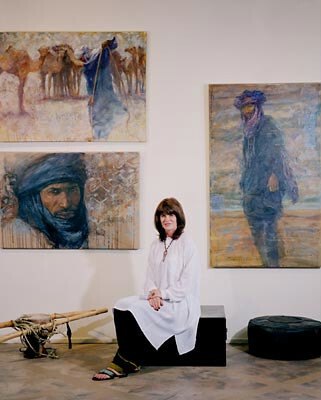 Leslie founded the Nomad Foundation, a project of the Ojai-based Wild Foundation, which is dedicated to the preservation of cultural and artistic traditions in Africa. Leslie Clark’s documentation took place in 2000. The FOTM Archive contains extensive information about this artist.